The Danish, left-footed Andersen learned the art of placekicking as an exchange student in high school and went on to excel at Michigan State, where he once connected on a 63-yard field goal against Ohio State. Chosen by the Saints in the fourth round of the 1982 NFL draft, his pro career got off to a rough start when he missed most of his rookie year due to injury. However, he came back strong in ’83, hitting on 18 of 24 field goal attempts (75.0 %) and added another 20 field goals in 27 tries in 1984 (74.1 %). He also connected on 71 of 72 extra point attempts over the span of those two seasons. Saints went 5-11 to finish third in the NFC West. 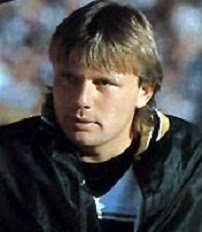 Andersen was selected to the Pro Bowl in each of the next three seasons and was a consensus first-team All-NFL selection in 1986 and ’87. During 13 years in New Orleans, he kicked 302 field goals in 389 attempts (77.6 %), with 22 of those successful kicks coming from 50 yards or more, and added 412 extra points (missing six times) to become the franchise’s all-time scoring leader with 1318 points. He was chosen for the Pro Bowl twice more. In a surprising move, Andersen left the Saints for the rival Falcons as a free agent in 1995 and tied his career high with 31 field goals, out of 37 attempts, again achieving consensus first-team All-NFL and Pro Bowl recognition. He went on to play five more seasons in Atlanta, which included a NFC Championship in 1998 after he kicked the winning field goal against the Vikings in overtime of the conference title game. Andersen moved on to the Giants for a year, spent 2002 and ’03 with the Chiefs, was with Minnesota in 2004, and then, after sitting out a year, returned to Atlanta in 2006 and ’07, finishing out his 25-season career at age 47. His 89.3 field goal percentage in 2007 (25 of 28) was his career best. He ended up as the NFL career leader in scoring (2544 points) and field goals (565), as well as having appeared in the most games (382) and scored in the most consecutive contests (360). Andersen was three times a consensus first-team All-NFL selection, received at least second-team or All-NFC honors on three other occasions, and was chosen to the Pro Bowl seven times. In addition to the Saints, he is also the career scoring leader for the Falcons (806 points), making him the only player to hold that distinction with two different NFL teams.